United Nations Secretary-General delivers his remarks remarks to the Summit of the League of Arab States, Tunis, 31 March 2019. 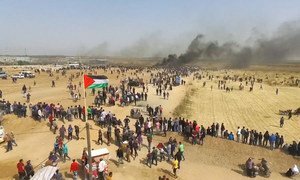 “There is no Plan B: without two states, there is no solution,” he stressed, noting that the ongoing violence in Gaza is a tragic reminder of the fragility of the situation. “Let us work ever closer together to unleash the full potential of this vital region, respond to the aspirations of youth and build a better future for all,” the UN chief concluded.